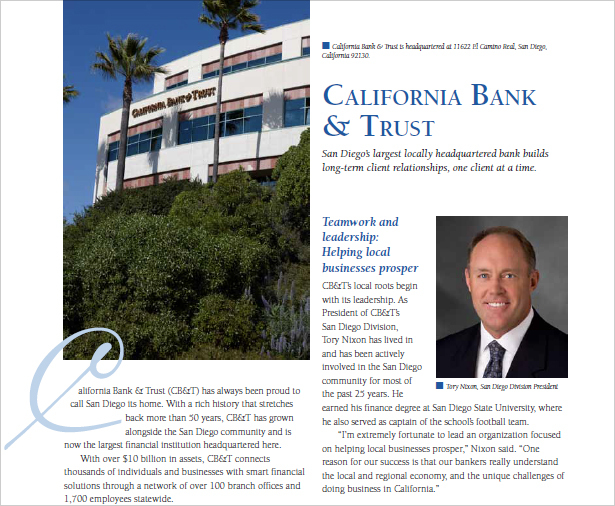 As a financial institution focused specifically on business banking, California Bank & Trust serves many regions throughout the state, including the San Diego area. This two-page advertorial appeared in a local San Diego magazine. The article focuses on the bank’s core approach of building long-lasting client relationships to help businesses prosper. It also discusses the bank’s sophisticated financial solutions – including cash management, international banking, merchant services, and others. Part of the advertorial is shown below, with complete copy available here (PDF).